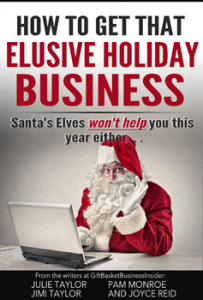 This ebook is the “best of the best” articles about how to get that elusive holiday business that have been published in the Gift Basket Business Insider magazine during the previous five years. The writers (Julie Taylor, Jimi Taylor, Pam Monroe, and Joyce Reid) are all gift basket company owners who have been there and done that. Each of them have been in business for twenty plus years and share with you the nitty-gritty details about what you should be doing throughout the year to make your fourth quarter successful as well as what you should be doing if you are reading this book late in the season and need a jump-start. Order this ebook today and it will be delivered to your email box in pdf format within 24 hours.